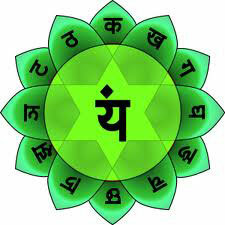 Anāhata is the fourth primary chakra according to the Hindu Yogic, Shakta) and Buddhist Tantric traditions. In Sanskrit the word anahata - means unhurt, un-struck and unbeaten. Anahata Nad refers to the Vedic concept of unstruck sound, the sound of the celestial realm. The Anahata chakra is positioned in the central channel behind the spine at the heart region, with its kshetram or superficial activation site actually in the heart region between the two breasts. Anahata is represented by a smoke grey lotus flower, with 12 vermilion petals. Inside of it is a smoke-coloured region that is made from the intersection of 2 triangles, creating a shatkona. The Shatkona is a symbol used in Hindu yantra that represents the union of both the masculine and feminine form. More specifically it is supposed to represent Purusha (the supreme being), and Prakriti (mother nature, or causal matter). Often this is represented as Shiva - Shakti. The deity of this region is Vayu, who is smoke coloured, four-armed, holding a kusha and riding upon an antelope, the animal of this chakra. The seed syllable is the mantra 'Yam', dark-grey in colour. Within the bindu or dot above the syllable resides the deity Isha (Lord in an all pervading form), who is either shining white or blue in colour, with either 1 or 5 faces, 3 eyes on each face, with either 2, 4 or 10 arms, clad in a tiger skin, holding a trident and a drum, or making gestures of granting boons and dispelling fear. His shakti is Kakini, who is shining yellow or rose in colour. She has a number of variations, having either 1, 3 or 6 faces, 2 or 4 arms, and holding a variety of implements, occasionally a sword, shield, skull and trident. She is seated on a red lotus. The twelve petals are vermilion coloured, and upon them are inscribed the syllables kam, kham, gam, gham, ngam, cham, chham, jam, jham, nyam, tam and tham in Sanskrit. They match the vrittis of lust, fraud, indecision, repentance, hope, anxiety, longing, impartiality, arrogance, incompetence, discrimination and defiance. Anahata is considered the seat of the Jivatman, and Para Shakti. In the Upanishads, this is described as being like a tiny flame that resided inside the heart. Anahata is so called because it is in this place that sages hear that sound (Anahata – Shabda) which comes without the striking of any two things together." It is associated with the element of air, the sense of touch, and with actions of the hands. Anahata is associated with the ability to make decisions outside of the realm of karma. In Manipura and below, man is bound by the laws of karma, and the fate he has in store for him. In Anahata, one is making decisions, 'following your heart', based upon one's higher self, and not from the unfulfilled emotions and desires of lower nature. Meditation on this chakra is said to bring about the following siddhis, or occult powers; he becomes a lord of speech; he is dearer than the dearest to women; his senses are completely under control; and he can enter at will into another's body. Hrit chakra, just below Anahata, is the seat of the wish-fulfilling tree. Immediately below Anahata at the solar plexus, or sometimes located slightly to the left-hand side of the body, is a minor chakra known as Hrit, or Hridaya (heart), with eight petals. It contains three consecutive regions, a vermilion sun region, within which is a white moon region, within which is a deep-red fire region, and within this is the red wish-fulfilling tree, kalpa taru, which symbolizes the ability to manifest whatever one wishes to happen in the world. Hrit chakra is occasionally identified as Surya (Sun) chakra, which again is situated below the heart, and sometimes slightly to the left. Its role is to absorb energy from the sun, and to provide heat to the body and other chakras, in particular to Manipura, to which it provides the Agni or fire element. Anahata is said to be located near the region of the heart. Because of its association with touch, it is associated with the skin, and because of its association with actions of the hands, it is associated with the hands. In the endocrine system, Anahata is supposedly associated with the thymus gland, located in the chest. In Kundalini yoga, anahata is awoken and balanced through practices including asanas, pranayamas, and the practice of ajapa japa (the practice of japa without the mental effort normally needed to repeat the mantra.). It is purified through the process of bhakti (devotion). The heart wheel in Tibetan Buddhism is the location of the indestructible red and white drop. At the time of death, all the subtle winds of the body dissolve and enter into this drop, which then leaves the body into the Bardo, intermediate stage, and then into rebirth. The heart wheel in this model is circular, white, and has 8 petals or channels that reach downwards. These channels divide into 3, the mind wheel, speech wheel, and body wheel, and go to 24 places in the body, after which they divide into 3 again, and then into 1000, producing 72000 channels, known as Nadi which spread out throughout the whole body. The heart wheel is very important within meditation. 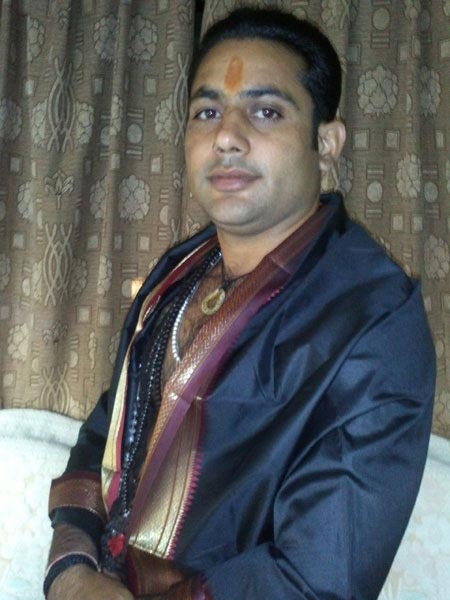 In the lower tantras, the recitation of mantra is done from the heart. At first, a mantra is recited verbally, then mentally, and then inside of the heart a tiny moon disc and a flame is imagined, from which the sound of the mantra is heard ringing out. In the higher tantras, the Anuttarayoga Tantra of the Sarma schools or the Inner Tantras of the Nyingma school, the practitioner attempts to dissolve the winds and drops into the central channel at the level of the heart in order to experience the Yoga of Clear Light; this is one of the practices of the 6 yogas of Naropa. In the Tibetan scheme of chakras there is also included a chakra known as the Fire Wheel. Its position is not, however, the same as the Hrit/Surya chakra, but is instead above the heart and below the throat. On the kabbalistic tree of life, the central sephirah, Tiphereth, is associated with the heart region. Christian kabbalists in particular associate this sephirah with love, healing and Jesus Christ. The Sufis manage a system of Lataif-e-sitta, that are positioned at various points on the body, and at the level of the heart there are 3 positioned horizontally. To the left of the chest is the Qalb, or heart, the Ruh, on the right hand side of the chest, and the Sirr, or secret, of the innermost heart, between the two of them. The Qalb is called the heart of the mystic, which is caught between the downward pull of the lower nafs, and the upward pull of the spirit of Allah, and thus it can be blackened by sin. It may be purified by recitation of the names of God. The Ruh is the centre of the spirit, the breath of Allah, and when awoken it counteracts the negative pull of the nafs. The Sirr is the secret or innermost heart, called the heart of the heart, where Allah manifests his mystery to himself. In Qigong the middle Dantian is located in this region. This Dantian is one of the three furnaces that transform energy in the body. The middle Dantian transforms the qi energy into shen, or spirit energy.